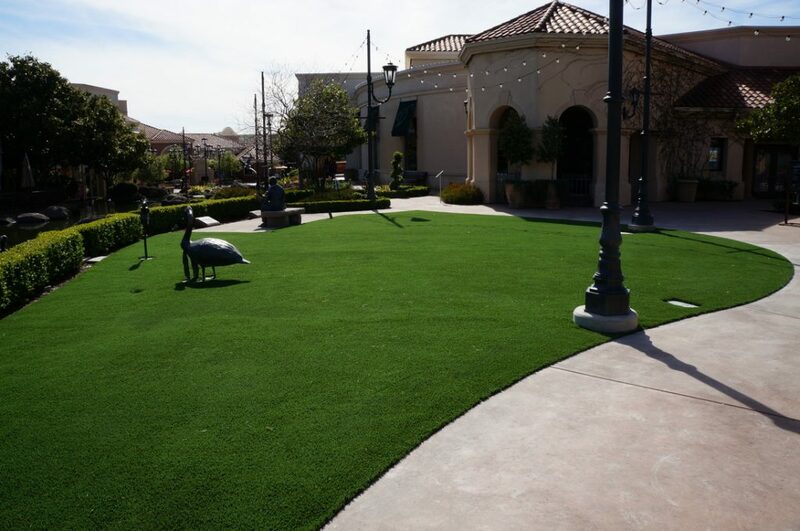 San Diego Artificial Grass is a synthetic turf company that has been serving San Diego for many years. We consider ourselves the best artificial grass and synthetic turf installation company in San Diego. Homeowners and businesses call us when they need the best synthetic turf installed on their lawns. When we come and install artificial turf for you rest assured that your expectations would be exceeded, whether you decide to install an artificial grass putting green, synthetic grass playground or artificial pet turf. No matter what the synthetic turf project may be, our professional installers work meticulously to ensure the best high quality result. We understand that there are numerous synthetic turf companies for you to choose from. However, we stand out from the crowd because we actually have your best interests in mind regardless of how large or small your budget is. We remain 100% honest with you at all times. This is why customers know that we are the artifical turf company that can be trusted. The products that we offer are of the highest quality. Our fake grass installation professionals who have been doing this for years install each turf uniquely. Our products are strong, durable, immaculate, and the finishing result is a beautiful turf that increases your property value. Everyone who sees your lawn is going to compliment you on its beauty and when you see how much this investment saves you over the years, you are going to be pleased to have made the decision to bring your business to us. Literally, there is no other synthetic turf company in the area that can compete with us. Our products are the best of the best! You can contact us via email or phone. Either way you will be promptly responded to by a professional agent who can readily answer any questions and concerns that you may have about our business. We understand how costly maintaining and lawn can be and we want to make sure that you make an informed decision when deciding to have an artificial turf installed. Our prices are competitive, we are always lowering them so many homeowners, and business owners can experience the benefits that come along with having artificial turf. Our customer service is remarkable and once speaking with one of our team members you will know that our company is the best one in the San Diego area. Our services are available to anyone who needs an artificial turf installed. We have worked with homeowners, business owners, schools, pet facilities, hospitals, and more. There is never a job that we consider too large or small, no matter what the artificial turf project may be. Whether it’s installing a custom shade sail or tree well surfacing, we will help you throughout the entire process because we are big on providing the highest quality customer support. We know that all of the options that we have available can be overwhelming. However, we have so many options available to be sure that you get the products that are best for your needs and desires. Artificial golf putting greens, playground grass and synthetic pet turf are just some of the options we offer to our valued customers. Nevertheless, if at any time you need assistance or have a specific artificial grass project in mind, one of our dedicated agents is more than happy to provide you with tips and recommendations. We understand that artificial turf is new to you and you want to get a good return on investment. We have an FAQ page available and individual pages available for deeper explanations about our products so you can educate yourself before contacting us. Making a purchase is easy. We give you a flat rate and you do not have to worry about hidden fees or us changing the price later. We are upfront about the price and we will tell you in detail exactly what to expect before you give us any money. If you are ready to make one of the best investments that you could ever make for your property contact us today! We are ready to turn your lawn into something that you never could have imagined in a dream. All you have to do is make the choice to give us a call today! To get your free artificial grass estimate today, or if you have any questions about our great service, contact the professionals at the best artificial grass and synthetic turf installation company in San Diego. Call us today! Artificial Grass / Synthetic Turf installation services provided to the following communities in San Diego, California: Allied Gardens, Alpine, Alta Vista, Bay Terraces, Balboa Park, Bankers Hill, Barrio Logan, Bay Ho, Bay Park, Birdland, Black Mountain Ranch, Bonita, Bonsall, Border, Broadway Heights, Burlingame, Cardiff, Carlsbad, Carmel Mountain Ranch, Carmel Valley, Chollas View, Chula Vista, City Heights, Clairemont, College Area, Columbia, Coronado, Cortez Hill, Del Cerro, Del Mar Heights, Del Mar Mesa, Downtown San Diego, East Elliott, East Village, Egger Highlands, El Cajon, El Cerrito, Emerald Hills, Encanto, Encinitas, Escondido, Fallbrook, Gaslamp Quarter, Gateway, Golden Hill, Grant Hill, Grantville, Harbor Island, Harborview, Hillcrest, Horton Plaza, Imperial Beach, Jamul, Kearny Mesa, Kensington, La Jolla, La Jolla Village, La Mesa, La Playa, Lake Murray, Lakeside, Lincoln Park, Linda Vista, Little Italy, Loma Portal, Lomita, Logan Heights, Marina, Marston Hills, Memorial, Midtown, Midway, Mira Mesa, Miramar, Miramar Ranch North, Mission Bay, Mission Beach, Mission Hills, Mission Valley, Morena, Mountain View, Mt. Hope, National City, Navajo, Nestor, Normal Heights, North City, North Park, North Clairemont, Oak Park, Ocean Beach, Ocean Crest, Ocean View Hills, Oceanside, Old Town, Otay Mesa, Otay Mesa West, Pacific Beach, Pacific Highlands Ranch, Palm City, Paradise Hills, Pauma, Point Loma, Point Loma Heights, Poway, Prince Valley, Ramona, Rancho Bernardo, Rancho Encantada, Rancho Peñasquitos, Rancho Santa Fe, Redwood Village, Rolando, Rolando Park, Roseville-Fleetridge, Sabre Springs, San Carlos, San Diego, San Pasqual Valley, San Ysidro, Santa Isabel, Santa Luz, Santee, Scripps Miramar Ranch, Scripps Ranch, Serra Mesa, Shelltown, Shelter Island, Sherman Heights, Silver Strand, Skyline, Solana Beach, Sorrento Mesa, Sorrento Valley, Southcrest, South Park, Southeast San Diego, Spring Valley, Sunset Cliffs, Tierrasanta, Torrey Pines, UTC, Valencia Park, Valley Center, Village of La Jolla, Vista and Warner Springs.